Ah, the NBA was a good sanctioning body however, what happened was Jeff and I had a falling out. He was leaning more towards what the NBA told him to do and I said, ya know if we do what they tell us to do we’re not gonna be our own person anymore. The end of Craigmeur and BMX loses its first historic track. What was the demise of Craigmeur? 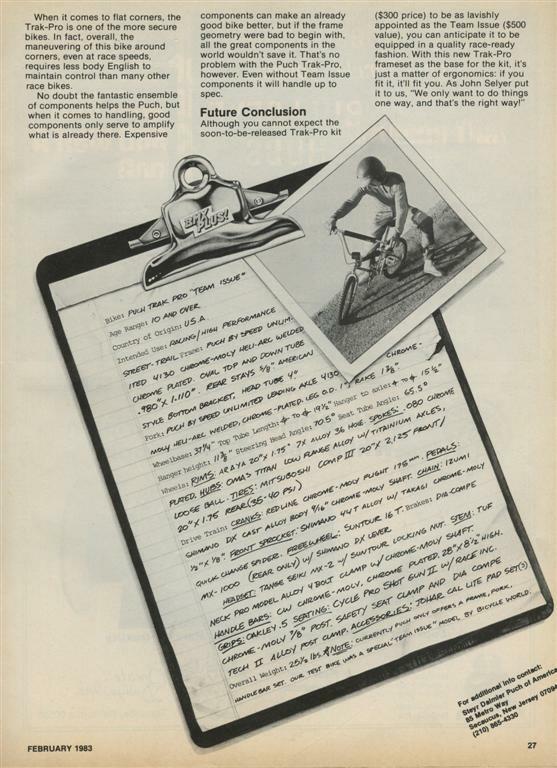 I took on another partner, I got a little burnt out and said you take it over, I was already well entrenched in the bike business with Puch and developed a BMX bike for them called The Trak Pro, which was made by Thruster. (yes that Thruster) They were people from NJ. (at this point Harry asked me if I ever heard of Thruster, I was a JV local, I lived around those maniacs! OF COURSE! LOL) They made the Trak Pro for us. Unfortunately they had to close down. (Thruster not Puch) But in their time they were doing very well, they had some of the top welders that you could imagine. 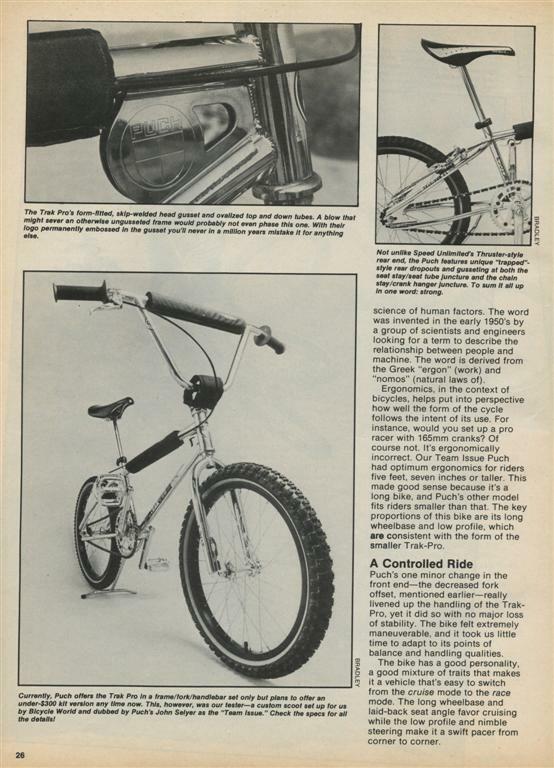 The interesting thing is prior to using Thruster as the producer of bikes for Puch, I had gone to California and I had visited with CYC, I visited Skip Hess, he told me the history of Mongoose and how that came about. 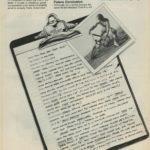 He was willing to make a bike for Puch. Linn Kastan from Redline. They were all willing to do private label for us but because Thruster was local and close by to us we decided that based upon their quality we would have them do our bikes. It was quite an adventure and a very good experience. 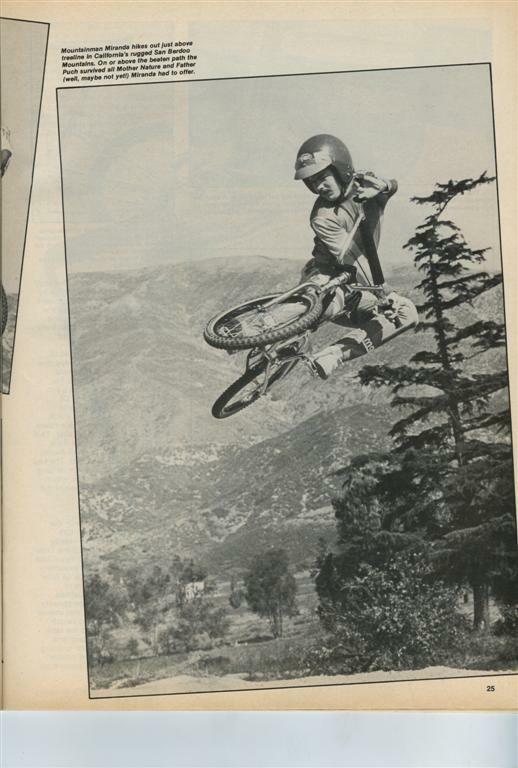 But that was the early days of BMX and when Craigmeur went away there was enough tracks to pick up the slack. 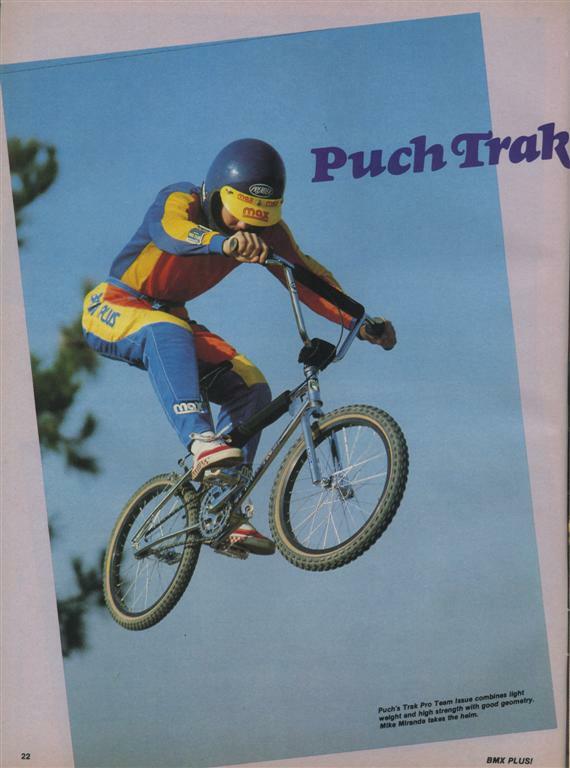 Whatever happened to Puch BMX? 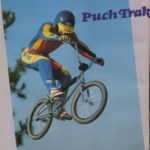 What happened with Puch, is that it was taken over by its distributor in Canada called Bombadier, even though they still maintained the name Puch. They had some major management changes. I had a huge territory and business is business sometimes when you have a huge territory and you’re making a lot of money, I’m talking about not just a good living, A LOT, way more than your bosses, they say , “well I think you’re territory is a little too big, we gotta split it up, we don’t know how you can handle it. Basically that’s what happened. It was a parting of the ways. The average BMXer and how it felt to have everyone at the track. A little about Charlie Litsky. wanted to do. Ya know he was mountain biking at the time. 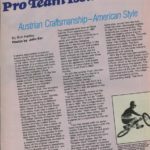 Here’s really what Charlie Litsky was all about, because I read so many things that are so untrue about Charlie saying he was the one who started BMX. Charlie rode for a bike shop called Gapi Components. A family whose real name was Gaponivich. They were in Bogota New Jersey. 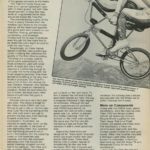 Charlie was 16 or 17 years old, his dad was an editor for the sports section of the New York Times, he had just moved from California, he was a very personable kid, and he was like an unofficial factory rider for Mongoose when he came here to the east coast from California. And we asked Charlie as we would clean the track together. Charlie you have some experience, give us some ideas on how you think the track should shaped to make it really competitive and interesting. He gave us some really good ideas and he was very active in coming out and giving us suggestions and being a promoter for the track. There was one day though when I got a little tired of announcing and I saw a 17 year old who had some of the greatest verbal talents I had ever seen and I said “Hey Charlie, How’d you like to do some announcing here” and he jumped at the opportunity and he did for a few times. But that was the extent of Charlie Litsky in the early days of course he went on during his college days and his career to become a sports announcer. He actually had done some announcing for the Olympics for cycling. 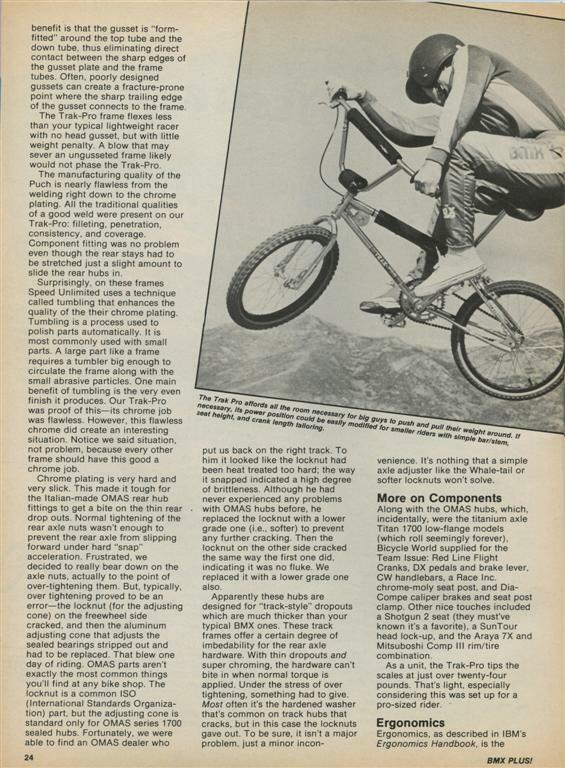 The myth of him being the creator of BMX in New Jersey is not really the case. He was one of the active people that was there and making the suggestions and was ever present when we needed him. He was really good he spoke the language perfectly. I was very impressed with Charlie and we remained good acquaintances over the years and as I went through the biking business I saw him develop into a really good young man. And just when he got married, I mean he wasn’t even married a month and he passed away. It was….really, really…really sad. He was only in his early 30’s at that time. But he was always willing to help people out, he was a very supportive individual and I can see why so many people liked him. He was very sincere. He, he was a good guy. I remember James Vincent Bikes putting on indoor racing in the Jersey City Armory. One of the races there actually took place the day after John Lennon was shot. I remember asking for a moment of silence in memory of one of the Beatles. It’s been a lot of years and sometimes there are things my family reminds me of that I don’t remember, LOL. whatever you want, if you can create a bicycle line for us we’ll do it. So I what I did was I went around to all the bike shops, one of my biggest supporters was a shop called Beacon, down in Northfield, NJ. (NJ residents should be familiar with that chain) The person who was really doing their bicycles was a young man at that time named Mitch Rogan. Mitch said, Harry I got some ideas for you. So I went around to a lot of different bike shops and they all had a lot of ideas on what they would want in a bicycle line. So we made prototypes from frames that I got and components that they said should go on there. And Mr. Slifka, that’s how I always referred to him, he had a summer home in Long Branch. He said, let’s have a little party for all these dealers. There were 12 dealers who were really major contributors. He said, why don’t you bring all the bikes there and we’ll make a really big shindig so they can look at the bikes and have a really good time. We’ll get the best food we can get, and turn it into a real happening. So they all came down, they looked at the bike line, they critiqued it, tweaked it, and Slifka said “you know we have the approval of these bike shops, we’ve got a core of good bicycle shops here in NJ, I’m willing to bet that if we make these bikes fast enough in time for Christmas. This was around September. He said if we can do this and have bikes by Christmas, we’ll be in good shape. He said, do you have a passport. I said no. He said Iook I have connections, I’ll get you an emergency passport, you’re going to Taiwan to meet with our agents that have all the connections with bicycle manufacturers and we’ll get this done. So….we did! And we had a bicycle line with General from Mountain Bikes to road bikes to BMX bikes to children’s 16” bikes, we had an entire line. 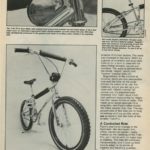 And one of the innovations that I made because I knew that bikes were always being ripped off in New York was the quick release front wheel, because people used to chain them to the pole at the time. I said you know if you can chain that to a pole and we can get that front wheel off it’ll lower the theft rate because who wants to steal a one wheeled bike. And for some reason, someone who was very smart, liked that idea and started putting quick release on all the mountain bikes and just making the quick release a little stronger. That’s sorta the funny reason you see mountain bikes with the quick release on the front of them. 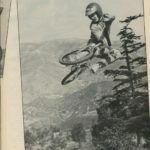 Next week, the end of the Harry Myers interview and all about General Bicycles Freestyle years, the scooter explosion, F1 racing and where he’s at now. 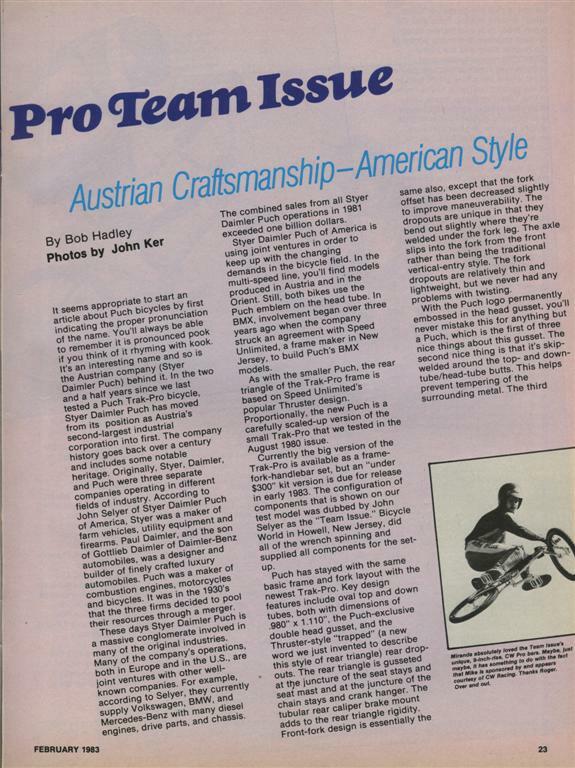 To me it is unbelievable to see how one person touched BMX racing in so many eras in so many ways.